I have been very lucky to work for an initiative termed ‘Systemic M&E’ (although we talk more about the ‘M’ than the ‘E’), focusing on ways to move away from a linear and static understanding of the systems we work in and develop tools and approaches that let us monitor changes in the complexity of the real world. So far, this initiative has produced a discussion paper that is based on various earlier discussions of market development practitioners. You can find the discussion paper here. Further we organized a three day e-consultation and a webinar around ‘innovations in measuring impact in market and financial systems’. Read the online discussion here. The webinar featured speakers from various spheres of the development world, i.e. Kate Lauer, Policy/Advisory Consultant for CGAP, Mike Field, Senior Market Systems Specialist at Adam Smith International, Stacey Young, Senior Learning Advisor at USAID, and Eelke Wielinga, Independent Consultant and Professor of Network Dynamics at Wageningen Business School. View the webinar recording. As a current peak of importance, we organized the opening plenary of this year’s SEEP Network Annual Conference in Washington, DC, promoting three speakers that are seasoned in applying concepts from complexity and systems thinking in their work in monitoring and evaluation. The speakers were Elizabeth Dunn of Impact LLC in the US, Shamim Bodhanya of the University of KwaZulu Natal in South Africa, and Richard Hummelbrunner of ÖAR Regionalberatung in Austria. The panel was moderated by Shawn Cunningham of mesopartner. You can listen to a live recording of the plenary here. We will now bring together all discussions and insights into a paper that will be released early next year. Hopefully, however, the initiative will move forward for much longer since there is still a lot of work to do! 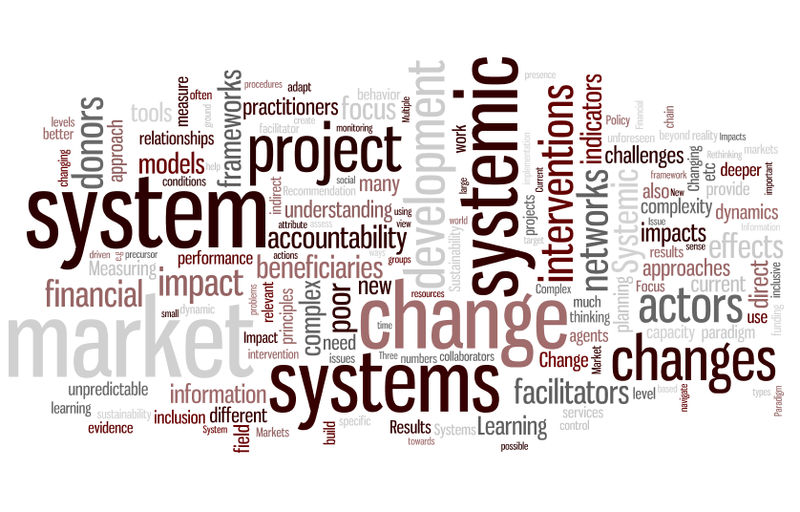 This entry was posted in my work and tagged complex adaptive systems, evaluation, results measurement, systemic monitoring, webinar on November 13, 2012 by Marcus Jenal.